​Improvisational Topography #60 is from my ongoing series called...you guessed it...Improvisational Topography (Impro Topo, for short). It is a straight abstract photograph of the downstairs bathroom curtain in my house. 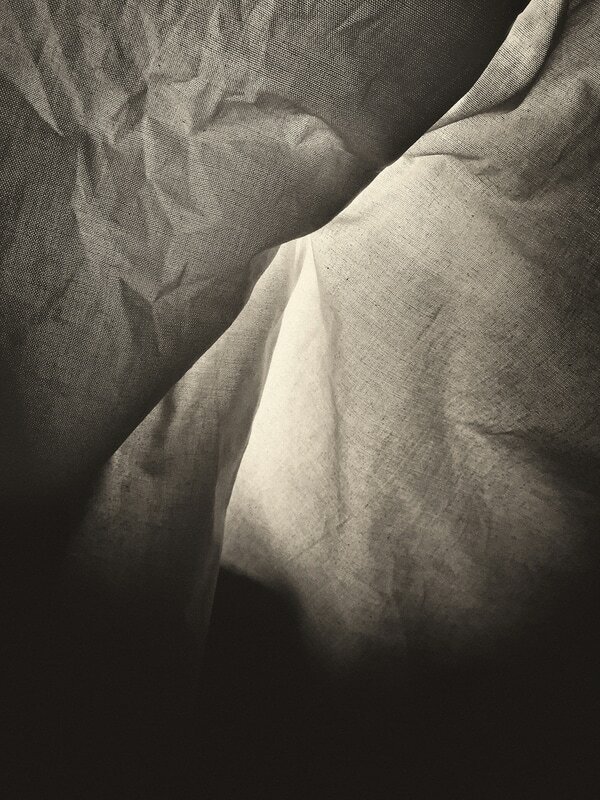 The series, 11 images and counting, is a collection of photographs of only that one curtain, so far. I’m milking that curtain for all it can provide. But I’m not really photographing the curtain. I’m photographing light and shadow, line and shape, tone and texture, after - full disclosure here - I’ve manipulated the fabric by wadding, twisting and crumpling to see what happens. That’s the improvisational part. The topography is the landscape of the fabric AND the landscape of my mind - my experiences, ideology, imagination - which produces my interpretation of what’s there. I have differing interpretations of Impro Topo #60, but I'm reluctant to share them. Partly because I’m quite suggestible myself I hesitate to prejudice how you construe what’s here. I would be very interested in knowing what you see. You’ll likely have another interpretation based on YOUR life, a takeaway not remotely close to mine. I would be thrilled if you see what I see, but I offer the pieces in this series for interpretation, not indoctrination. With the Impro Topo series I’m trying to follow the advice I offer to my photography students: stare, observe, allow the self to disappear and to be absorbed into your surroundings. All this in service to seeing what’s there, connecting with it, creating a relationship with it, whether you’re surrounded by pristine wilderness or looking at a curtain in your downstairs bathroom.